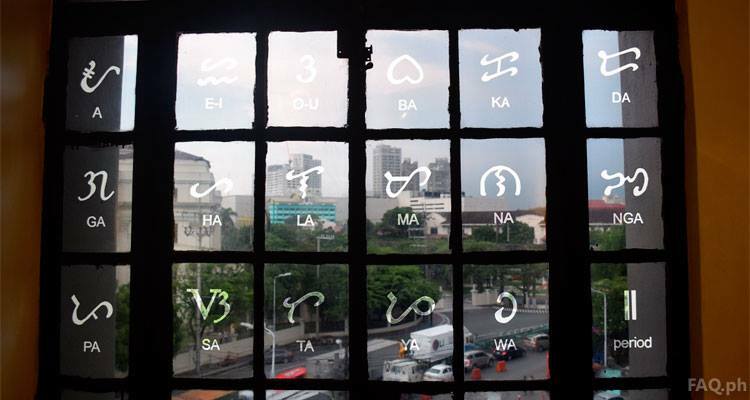 Baybayin known as Tagalog alphabet is an ancient Philippine script. I used to think that the only language we have here in the Philippines is Filipino. It may be our national language, but there are actually more languages here in our country than we know. Because there are more than seven thousand islands in the Philippines, it is no wonder why we have many languages which most of us consider as dialects. There is a difference between dialect and language, though. According to Dictionary.com, a language is used by people who are of the same community or nation, the same geographical area, or the same cultural tradition. While the dialect is a variety of a language that is distinguished from other varieties of the same language by of phonology, grammar, and vocabulary. Our national language was based from Tagalog. It is used mainly in Manila Area and nearby provinces such as Batangas, Bulacan, Cavite, Nueva Ecija, and Laguna. This is the only Filipino language that is generally used and can be understood around the country. Based on the Philippine census conducted by the Philippine Statistics Authority, there were 26,387,855 Filipinos who speak this language in the country. Cebuano is the next most spoken language in the Philippines with a total of 21,340,000 Filipinos using it. This is mainly used in Cebu City and some areas in Mindanao, such as Butuan, Cagayan de Oro, Davao, and General Santos City. Ilokano or Ilocano is a combination of other languages from other countries such as Chamorro of Guam, Indonesian, Hawaiian, Malay, Samoan and Tahitian. It is mostly spoken in the Northern part of the country but because Ilocano speaking people have spread throughout the Philippines, it ranked as third of the most spoken language with 7,779,000 Filipinos using it. Hiligaynon or Ilonggo is the language used in Aklan, Antique, Bacolod, Capiz, Iloilo, Panay Islands as well as in North and South Cotabato in Mindanao. This language is distinct for having a sweet intonation. And as of 2000, there were 7,000,979 sweet speaking Filipinos in the country. Goodbye – Asta sa liwat. If Hiligaynons are known for being sweet, the Waray people are known for being tough and strong. Waray is spoken in the Eastern Visayas, particularly Samar and some parts of Leyte and Biliran Province. The Waray comes fifth with 3,100,000 Filipinos using this language as of year 2000. Kapampangan or Pampangueño are spoken by 2,900,000 Filipinos. This is mostly spoken in the northern part of the country particularly Pampanga Province, and portions of Bataan and Tarlac. Bikolano or Bicolano is the language used in the Bicol Region. Bicol is one of the biggest regions in the Philippines and there are about 2,500,000 Bicolanos speaking the language. Pangasinense is the language used in Pangasinan Province in Central Luzon. It has a population of more than 2 million and 2,434,086 of which use the language. Pangasinense is like the Ibalio language used by the people of Baguio City and Benguet in the mountain province. Good morning! – Maabig ya kaboasan! Good afternoon! – Maabig ya ngarem! I love you – Inaro ta ka. Maranaoan is the language spoken by 2,150,000 Maranao people living in Lanao del Norte and Lanao del Sur Provinces. It is a Western Austronesian language likewise used in Sabah, Malaysia. I Love You! – Pekababaya-an ko seka! Tausug is the language used by 1,822,000 people in the Sulu Archipelago, the Zamboanga Peninsula, and Southern Palawan. It is likewise used in the eastern part of Sabah, Malaysia, and North Kalimantan, Indonesia. Maguindanao – used by 1,800,000 residents of Maguindanao and some parts some parts of Mindanao. Chavacano – is from a Spanish word “Chabacano” which means tasteless. It is one of the oldest creole languages in the world and the only one in Asia. There are various dialects of Chavacano including, Zamboangueño, Caviteño, Cotabateño, Castellano Abakay (Chabacano de Davao), Ternateño (Bahra), and Ermiteño (Ermitense) with a total population of 1,200,000. Kinaray-a – is a Visayan language spoken in Antique Province and used by 1,051,000 Filipinos. Surigaonon – is mainly used by Surigaonon people from the province of Surigao del Norte, Surigao del Sur, Dinagat Islands, and some portions of Agusan del Norte especially the towns near the Mainit Lake, Agusan del Sur and Davao Oriental. There is more than 1,000,000 Filipinos using this language. Spanish and English are two languages we Filipinos got used to when we were still under the governance of Spain and America. Spanish – used to be the official language in the Philippines back in the 16th century but now, only around 2,000 Filipinos use this language. English – is a foreign language commonly used by Filipinos until today. In a survey conducted by Social Weather Stations(SWS) back in 2008, around 76% of Filipinos says they understand English. It is the language mainly used in schools, in the government, in the business world, and etc. This foreign language became an official language of the Philippines under the 1935 Constitution added alongside Spanish. Under the present constitution, approved in 1987, Filipino and English became joint official languages of the country. Although we have many languages most of us use Taglish or a combination of English and Tagalog. This is often used by the younger generation of Filipinos when texting or talking to friends. Filipinos abroad who have forgotten how to speak Tagalog use this too. Our languages just show how unique we Filipinos are. But no matter which part of the country we are from or what language we use we can always use Filipino or English to understand each other.